This is a story on the creation of one man's dream, his own personal museum that he now shares with the public. It is the Harlansburg Station, Museum of Transportation. Donald Barnes, a retired US Air pilot, started collecting things without a purpose over thirty years ago. He collected odd things, such as airplane propeller, which served as a clothing stand for one of his daughters in the corner of her bedroom. The frame of an unassembled bi-plane he moved into the garage in his North Hills home then proceeded to build, making this a "must see" attraction for the neighbors and visitors. He began constructing plastic airplane kits in his spare time, collecting thousands of boxed models. He went so far as to convince his wife and family to move 50 miles north onto a 60-acre farm where he could build an airstrip and airplane hanger. Then he had a purpose to his collecting. He built a museum so that he could share his passion with everybody. He designed a 30x90 replica train station and moved the four 80 foot cars by a gooseneck trailer. The wife, that had listened to the explanation of these purchases down through the years, was now wearing a bandana and dust mask, grinding off thirty years of peeling paint inside one of the railroad cars. The children, now grown adults, repainted the gold Pennsylvania lettering on the outside and laid the carpet on the inside The entire family catalogued and displayed over three thousand objects. The museum was complete. 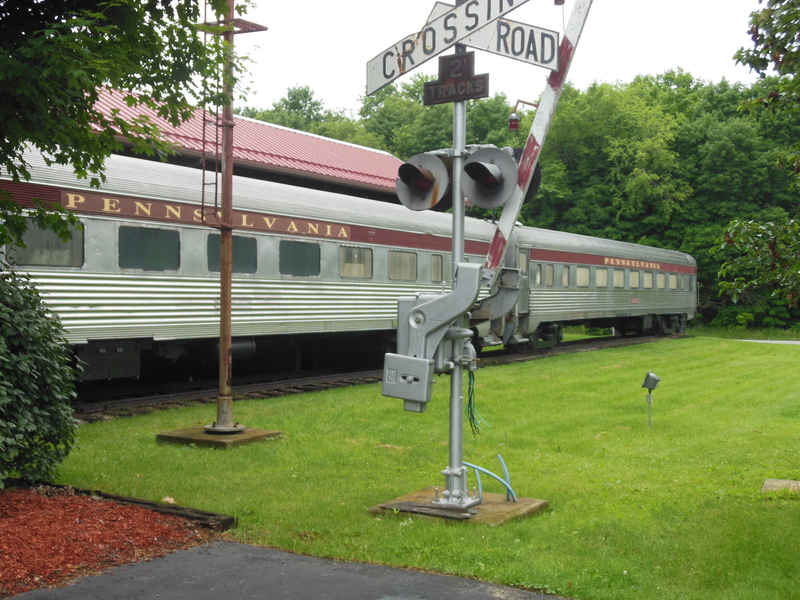 For the past sixteen years the Harlansburg Station has remained a private museum, receiving no state or federal funding. The owner and his family welcome people from Pittsburgh, the tri-state area, and from around the world to share his love of transportation. Come and visit one of the best-kept secrets and enjoy somebody's dream.